The House of Councillors has 242 members who each serve six-year terms, two years longer than those of the House of Representatives. Councillors must be at least 30 years old, compared with 25 years old in the House of Representatives. The House cannot be dissolved, as only half of its membership is elected at each election. Of the 121 members subject to election each time, 73 are elected from the 47 prefectural districts (by single non-transferable vote) and 48 are elected from a nationwide list by proportional representation with open lists. The House initially had 250 seats. Two seats were added to the House in 1970 after the agreement on the repatriation of Okinawa, increasing the House to a total of 252. Legislation aimed at addressing malapportionment that favoured less-populated prefectures was introduced in 2000; this resulted in ten seats being removed (five each at the 2001 and 2004 elections), bringing the total number of seats to 242. Further reforms to address malapportinoment took effect in 2007 and 2016, but did not change the total number of members in the house. 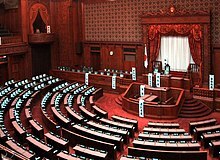 From 1947 to 1983, the House had 100 seats allocated to a national block (全国区, zenkoku-ku), of which fifty seats were allocated in each election. It was originally intended to give nationally prominent figures a route to the House without going through local electioneering processes. Some national political figures, such as feminists Shidzue Katō and Fusae Ichikawa and former Imperial Army general Kazushige Ugaki, were elected through the block, along with a number of celebrities such as comedian Yukio Aoshima (later Governor of Tokyo), journalist Hideo Den and actress Yūko Mochizuki. Shintaro Ishihara won a record 3 million votes in the national block in the 1968 election. The national block was last seen in the 1980 election and was replaced with a nationwide proportional representation block in the 1983 election. The national proportional representation block was reduced to 96 members in the 2000 reforms. ^ a b c d e f "参議院議員選挙制度の変遷" [Changes to the electoral system of the House of Councillors] (in Japanese). Retrieved 12 December 2016.